The Mesoamerican Ballgame was hugely sigificant to both daily life and imperialistic exanpansion. People would practise religiously, with the game apparently symbolic of a battle between the Gods. The game would then be played to resolve both internal politics and in place of warfare with opposing tribes, with the losers being sacrificed to the Gods and the winners taking whatever was at stake, be it prisoners, riches or lands. 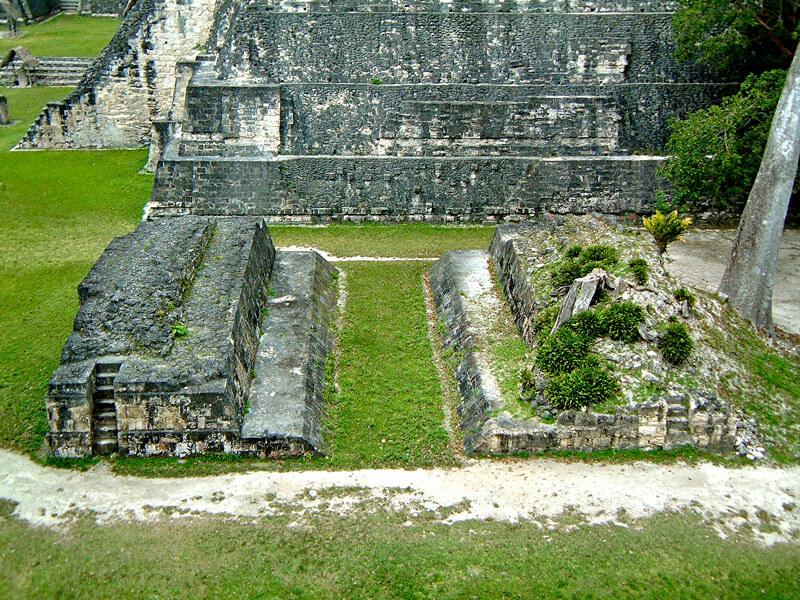 The ballcourt here on the Main Plaza at Tikal, however, is far too small to have ever been used competitively and may have been ceremonial (many cities had a ceremonial court), and used only for religious reenactments or as a memorial to a specific game or a renowned player – a kind of symbolic alternative to the stelae which litter the Main Plaza. The foot of Templo 1 is visible behind the court, to give you an idea of its prime location within the sacred Main Plaza of Tikal.